Since the takedown was published, the company has responded and arm-chair reactions have abounded. Here's what we know so far. We’re used to beef in the music world; it’s less common to see it in the realm of artisan chocolate. But if the past week has taught us anything, it’s that people want answers with their $10 chocolate bars. The food controversy of the moment surrounds Mast Brothers, the “bean-to-bar” purveyor known for its well-designed packaging and nouveau flavors like sheep’s milk and cold-pressed olive oil. Since they started out in 2007, the bearded brothers behind the Williamsburg-based company have received gushing coverage from major media outlets, a James Beard nomination for their cookbook, and splashy partnerships with the likes of Rag & Bone and Shake Shack. But they’re rapid rise as leaders of the foodie new school isn’t universally supported. Kenji López-Alt, the best-selling author of the The Food Lab, has been vocal about his distaste for the brand, which he calls “the poster child for the bad ‘artisan’ food movement in NYC.” And last year Slate ran a widely discussed story about how, despite Mast Brothers’ massive popularity, almost no speciality chocolate shops carry its product. Its ratings by real connoisseurs “would hit in the bottom 5 percentile,” the article claimed. The accusations center around the concept of “bean-to-bar” chocolate, which has been key to the Mast Brothers mythology. The phrase refers to a process of chocolate-making in which everything is done from scratch by the maker—from roasting, to tempering, to molding. 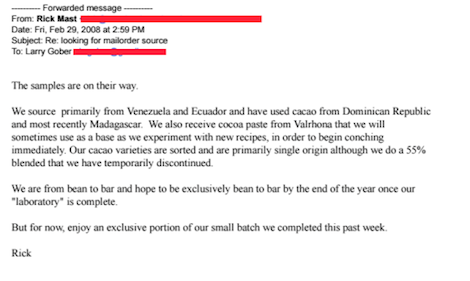 Craig argues that the brothers were simply “pretending to be a bean-to-bar chocolate company” in the early days, and has unearthed email correspondences suggesting that the brothers used remelted chocolate from the commercial French manufacturer Valrhona. Whether or not you think the Mast Brothers product tastes good, the core issue here is around transparency and the buzzwords that surround the artisan food movement. In an age where Domino’s uses the term handmade in its marketing and multinational conglomerates pose as “craft” beer, the details of process and sourcing are substantive. Much of the Mast Brothers success can be traced to its emphasis on authenticity, so any suggestion that it willfully misled consumers would be a huge blow to its credibility—especially when the chocolate bars in question cost $10. However, in an interview with the New York Times over the weekend, Rick Mast confirmed that “the brothers did use industrial chocolate, what is known as couverture, in some of their early creations.” A letter posted on the Mast Brothers website echoes this comment, chalking up the use of remelted chocolate as a necessary part of the brand’s early “experimental” phase. So while there’s little doubt that the company’s process is what it claims to be these days, Craig’s exposé suggests that Mast Brothers is not nearly as innovative as it claims to be, and has instead created a genius marketing campaign that lures consumers into their brand, rather than delivering an overall quality product. One thing’s for sure: We haven’t seen a cocoa controversy this big since Hershey’s blocked Cadbury from exporting British chocolate to the U.S.